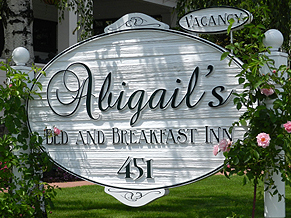 On the Road to Abigail's: Make Hay While the Sun Shines! Or in our case, paint the house! Last week southern Oregon was hit by a cold front and several days of rain, which delayed the painting. Yesterday and today were two beautiful warm fall days so Andrew worked like crazy and here are a few photos of the progress. This is Andrew in his anti-toxic breathing apparatus painting the back door porch. When he talks through it he sounds a little like Darth Vader, but with an English accent! One more patch of blah beige to spray over. The plants in the foreground are the result of Abi's hard work. When these fill out and bloom it will be beautiful. Abi's not so secret passion is gardening. Good thing the guests, in the garden room, had plans for the afternoon! For as long as I can remember I have wanted to own, remodel and live in a classic American "white" turn-of-the-century home. It is somewhat surreal to watch the transformation and to know we are living the dream.